A global taskforce comprising government authorities and industry body The Green Grid have selected three new metrics to improve a datacentre’s energy-efficiency. The metrics are Green Energy Coefficient (GEC), Energy Reuse Factor (ERF) and Carbon Usage Effectiveness (CUE). GEC, ERF and CUE will now join the metric Power Usage Effectiveness (PUE), which is currently used by datacentre managers globally. PUE was developed by the Green Grid in 2011. PUE is determined by dividing the amount of power entering a datacentre by the power used to run the computer infrastructure in it. Although used widely, experts have pointed out datacentre cases where PUE does not work. The new performance metrics by the global taskforce aim to help datacentre operators understand their facilities’ energy performance quickly and easily. The taskforce included the US Department of Energy’s Advanced Manufacturing Office and Federal Energy Management Programs; the US Environmental Protection Agency’s Energy Star programme; the European Commission Joint Research Center (JRC) Data Centers Code of Conduct, Japan’s Ministry of Economy, Trade and Industry; Japan’s Green IT Promotion Council; and the Green Grid. 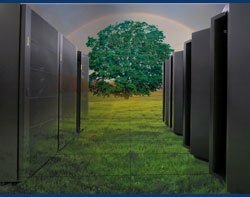 The first new metric - GEC - will quantify the portion of a datacentre facility’s energy that comes from green sources. The metric can be calculated on the basis of the green energy consumed by the datacentre (in kWh – kilowatt-hour) divided by total energy consumed by the datacentre (in kWh). The second metric - ERF - will identify the portion of energy that is exported for reuse outside of the datacentre infrastructure. ERF can be computed as reuse energy divided by total energy consumed by the datacentre. The third datacentre energy efficiency metric - CUE - aims to enable an assessment of the total GHG (Greenhouse Gas) emissions of a datacentre relative to its IT energy consumption. It can be calculated as the total carbon dioxide emission equivalents (CO2eq) from the energy consumption of the facility divided by the total IT energy consumption. “Although there is more work to do, we think the new metrics will bring us one step closer to a universally adopted set of metrics, indices and measurement protocols that will have a positive affect on the industry,” said Dickerson. The three new metrics were selected through discussion, exercise and trial among the taskforce participants. The datacentre efficiency taskforce have also launched a memo which provides a framework for users to approach the metrics holistically, ensuring datacentre owners and operators can assess and improve the performance of their mission critical facilities. “Taking an environmentally intelligent approach to energy efficiency will be critical to satisfy the demands of the regulatory authorities," said Dominic Philips, managing director of Datum. "Datacentres cannot easily claim to be green, but what they can do is ensure that energy is used efficiently and intelligently,” added Philips. The taskforce aims at harmonising metrics and measurement protocols for key energy efficiency metrics. The taskforce will continue collaboration as an on-going effort to improve datacentre energy and Greenhouse Gas (GHG) emission efficiencies, the Green Grid has said.